Ask fellow campers about "Masonic West River Park" and nearby attractions. We have now stayed here 4 times. They improved it by letting you rent a space online, not first come first serve...we hated not knowing if we could get a place. This is almost like staying in the country. You wake up to see the geese and the ducks and if on the river hearing the waves hit on a windy day. Beautiful peaceful spot. There are full service and electric only. All are very nice. If their business keeps up they'll have to enlarge their shower area's.\ We camped at Masonic West River Park in a Travel Trailer. There is a blacktopped walking/bike riding trail by campground...great taking a stroll around..Lots of shops from antiques to dress to quilt shops to look in and they have a Great new swimming pool. Sites 1-12 are full hookup sites with electricity, water, sewer. These are level, gravel sites for the big rigs. These sites are not near the river. Sites P1-P10 are 20,30,50Amp electric sites. No water or sewer. Parking is on grass with a slight slope towards the river. These sites are right on the river, with only a walking/biking path between the campsites and the river. We camped at Masonic West River Park in a Travel Trailer. Awesome park. Small (21 total sites), but includes sites for tents, sites for trailers (elect only) and sites with full hook-ups. Tent and elect-only sites are right on the river - beautiful! Home to a lot of geese and bald eagles! Tremendous value at $20/night for elect site. Easy walk to local businesses. 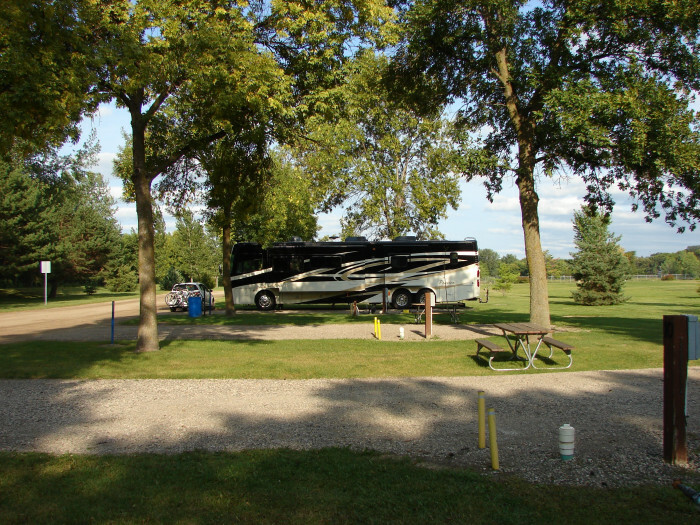 Must reserve online on City of Hutchinson website: http://www.hutchinsonprce.com/parks-campground-and-outdoor-activities/campground/ We camped at Masonic West River Park in a Motorhome. We came to stay for a day or 2, and stayed 6. The grass and area was well kept. Large grass area for kids to play anything including football. A black top trail for biking and hiking, and close to everything in downtown. 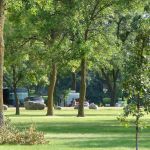 We camped at Masonic West River Park in a Travel Trailer. Close to downtown within walking distance: with antique shops, clothing, exercise, restaurants. Biking and hiking blacktopped trail. During summer months they have rentals to use on the water. We had large parking spaces with picnic table,fire ring,and trash barrels for each 2 campers...that was very nice. We had full hook up but they also have beautiful tent sites and sites with just electric. Lots to do with paved walking, biking trail close and wild life reserve..on river and the mosquitos were under control. We had a nice quiet 5 days and enjoyed ourselves immensley. 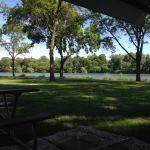 We camped at Masonic West River Park in a Travel Trailer. Best to be able to sit around fire and watch the many types of birds and or take quiet walks. Previous review is spot on. These sites are very roomy at 60 Ft CTC. Very popular on weekends. Since this is "first come first served" we had our son park a car in the last available FHU site to hold it for us on Thursday. There are 12 FHU sites, but there are also 10 electric only sites with good grass, that look like they have not been used this year. So with the dump station, that makes a good $15. Nice amenities including basketball, volleyball, lacrosse, swings, jungle gym, etc. We would stay here again. We camped at Masonic West River Park in a Motorhome. Masonic/West River Park is a Hutchinson City Park just south of highway 7 on Acoma Avenue (lat44.893515 long-94.389472) along the shore of Otter Lake and adjacent to the Luce Line Trail. The park has a dozen full hook-up, back-in sites situated at right angles to a gravel access road. 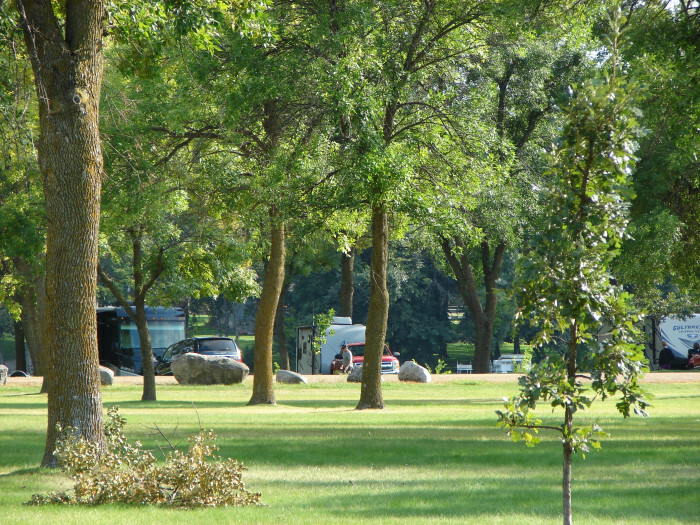 The sites have medium sized shade trees and are flat and level. Picnic tables and fire pits at each site. Site with hook-ups were $20 per night. 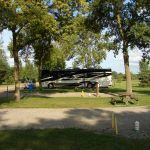 The rest of the park, including waterfront areas are available for camping without hook-ups with no specific site structure at $15 per night. Dump station available. Restrooms with running water, no showers. Boat landing for Otter Lake in the park. Play ground and picnic shelters available. Easy walking distance to downtown with stores, shops, and restaurants. 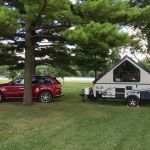 We camped at Masonic West River Park in a Fifth Wheel. Downtown shopping, end of town shopping, lots of antique shopping, beautiful country side, went mushroom hunting also Best to be able to sit around fire and watch the many types of birds and or take quiet walks. Are you affiliated with Masonic West River Park ?